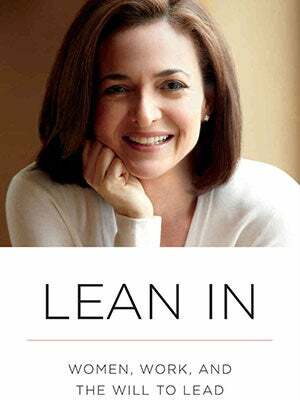 Facebook COO Sheryl Sandberg's new book, Lean In: Women, Work, and the Will to Lead came out yesterday. We're making our way through it slowly but surely, and we're riveted. We are here to support each other and learn from each other. “Lean In” gave me the opportunity to share my thoughts and some of the lessons I have learned. Now it’s your turn. By talking openly about the challenges that we all face in the workplace and at home, we can work towards solutions together. Pretty great, right? NPR even calls it "something of a feminist call to arms." And who can argue with that kind of progress on the gender-equality front, right? Sandberg opens her introduction talking about her pregnancy, and the difficulties she faced as a working woman (there's a co-worker's cringe-inducing reference to a "whale" and the fact that it never occurred to anyone at Google that pregnant women might benefit from reserved parking). But, the point she really makes here is that the parking thing never occurred to her, either, until she was pregnant herself — and that it's critical for women to think about other women and to stand up for themselves. All good, still, right? These don't sound like the words of a woman who hates mothers or people who aren't yet as successful as she is. And yet, those are exactly the types of criticisms being lodged against her. Angry critics suggest she doesn't care about the less privileged. Because asking women to stand up for themselves and progress the dialogue about gender equality in the workplace is socioeconomically limited? They also suggest that she has no value for women who choose family over career, pitting her against Princeton professor (and former dean), Anne-Marie Slaughter, who wrote a thought-provoking story for The Atlantic last year, asking if women can have it all. That's unfair, because Slaughter actually wrote a beautiful story about her own moment of leaning in, on Sandberg's site — that doesn't feel quite like the rivalry people suggest, does it now? But, the worst of all is that The New York Times posits that she's gotten the whole thing wrong (unfortunately building an argument on mis-edited quotes pulled out of context) and that corporations should be the ones being asked to lean in to women. Which is another — separately — valid argument. And certainly a conversation worth having. But does it devalue what Sandberg wants to tell women? That we should think critically about our careers and keep our eyes open for the moments that matter — the ones in which we'll truly benefit from committing to moving forward and achieving? All of which implies, conversely, that there are moments that are not worthy of that; that we shouldn't be killing ourselves to overperform at every juncture, but rather, only work harder when it counts. All solid, universal advice, if you ask us. And that's really the core of her thesis. That women need to be assertive, but they also need to acknowledge that sometimes, that comes with a unique set of gender-related obstacles (something one of the most powerful women in Silicon Valley certainly knows from experience). And what's most troubling here, is that the backlash we're seeing about Sandberg illustrates just that point. Nobody would ever look at a man offering advice to other men and say, "But you know, you're not addressing every man out there — your solution is only geared toward a piece of the problem, and you should be responsible for fixing everything, if you're going to take a crack at anything." Somehow, we think not. So, why should a woman be tasked with being everything to everyone, rather than lauded for doing something? For furthering a conversation that so desperately needs to happen. For bringing powerful women together to lead and inspire. Quite frankly, the whole thing makes us just a bit more motivated to do exactly what she's preaching. But tell us what you think. Do you have problems with Sandberg's advice to women? Or are you with us on our feelings about her critics?